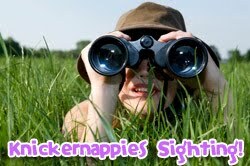 Marvelous Monday Knickernappies Sightings! Giveaways Galore! Welcome to another Knickernappies Sighting post! Today we've got a lot to share. There are tons of great Knickernappies Reviews & Giveaways for you to enter until your heart's content. Remember you can't win if you don't enter, right!? Enter to win a Knickernappies Onesize Pocket Diaper by becoming a Fan of Moms and Bums on FaceBook and commenting on their FB Wall! Giveaway ends June 11, 2010. Wee Little Changes is giving away another Knickernappies OS Diaper on their Blog! Many great and easy ways to enter, contest ends July 2, 2010 so you've got plenty of time! Home Grown Families is giving away a Knickernappies 2G Pocket Diaper w/ LoopyDo Insert! Head on over there and read their great review and enter the Giveaway! Giveaway ends June 16, 2010. Baby Hope's Cloth Diapers is sponsoring a Knickernappies Giveaway over at The Coupon Mommy of 3 Blog! Read the great review of the Knickernappies OS Diaper and enter for your chance to win one of your own! Giveaway ends June 16, 2010. Do you have a Knickernappies Sighting to share? Comment here or on our FaceBook Wall and let us know! We'd love to hear about it.